Bet2U is a highly regulated online sportsbook which prides itself in providing a legal and secure sports gambling environment to punters from all parts of the world. The bookmaker was founded in 2014 in accordance with the jurisdiction laws of Curacao. The site is owned and operated by Bet2U.com B.V. under licence number 135297. The company partners with Cyprus based technology firm Dazzlester Limited for payment processing, and their platform is powered by Betconstruct software. The site allows punters to bet on sporting events from all the major leagues in the world, and they also take stakes for virtual sports. 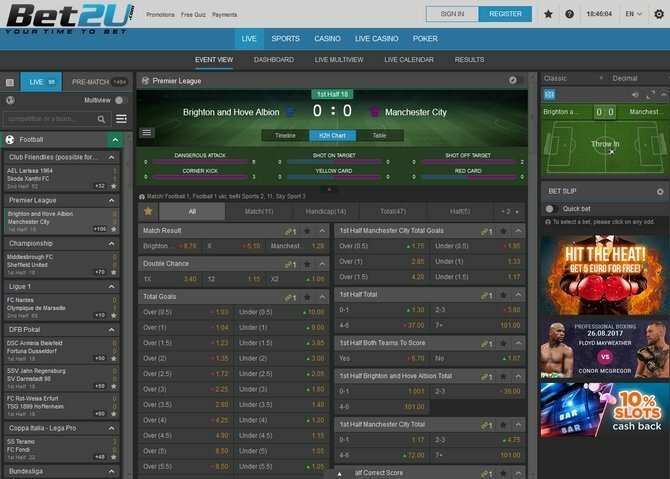 Powered by Betconstruct software, Bet2U offers bettors a user-friendly betting platform which is suitable for both beginners and seasoned punters. Their website incorporates a simple but professional layout design and you can easily pick your preferred bet from the available markets on the dashboard. All you have to do is click on particular the event on the dashboard and it will open up a whole lot of betting markets for you to choose from. In terms of loading speeds, Bet2U might not be the fastest betting site on the internet but its responsiveness is still highly commendable. In addition, the site supports more than 20 languages including English, Spanish, German, Polish, Turkish, and Norwegian. Bet2U might not boast a decade long of experience but their offerings are at par with most of the major players in the industry. The platform features more than enough markets for punters to explore, and their coverage extends to all the popular leagues and sporting event across the globe. The most covered sports include football, tennis, volleyball, baseball, basketball, and handball. However, the site also features less popular sports markets like Bandy, Aussie Rules, Gaelic football, and Hurling as well as special like Movies and TV shows and political events. You can select both pre-match and live betting markets from the dashboard, and you can view the available odds markets by clicking on a specific event. The available options include Totals, 1X2, Double Chance, Asian Handicaps, Handicaps 3 Way, Halves, and Correct Score. Their coverage of E-sports is also notable with more than 10 E-Sports to bet on. New members on the platform are welcomes with a sign-up sport bonus of 100% up to £300 as soon as they make their first deposit. In addition, you also get a free bet of 25% up to £75. To activate the offer, click on My Account and click the reward from the listed promotions in the bonus section. The next thing is to fund your account and the amount will be credited immediately. The free bet amount is then credited within 24 hours of making the deposit. The wagering requirement for the sign-up bonus is 16x the amount, and you have to fulfil the staking terms within 30 days of crediting. Also, the amount has to be wagered on single sports bet with odds of 2.00 or higher. Existing members on the platform can enjoy a weekly 100% bonus for any deposits made on Friday. The promotion runs from 0000 hrs to 2400 hrs GMT, and the maximum bonus sum awarded is £300. Punters can earn up to £100 in free bet amount for any deposit made on Wednesdays. The freebie is awarded at the rate of 10% of your deposit amount, and the maximum possible reward is £100 if you credit your account with £1000 or more. Other promotions include cash outs on select events and freebet bonuses. The bookmaker has a mobile friendly web version to allow punters to place bets on the go. To access the site from your handheld device, search Bet2U using your smartphone browser and you will be redirected to the mobile web version. The site is compatible with both Apple, android, and Windows devices. However, the bookie does not have a downloadable mobile app. Punters can credit their Bet2U accounts using the following payment methods; Visa, MasterCard, Neteller, Skrill, EcoPayz, Paysafecard, and Scratch Card. All funds deposited to the website are processed immediately hence you wager on the sporting event of our choice as soon as you make the payment. You can also withdraw your winnings using any of these methods, but it has to be the same option you used for your last deposit. Bet2U SafetyOther cashing out options include Bitcoin and Bank Wire Transfer, and you can withdraw between £20 and £500 using any of the two methods. The turnaround time for Bitcoin withdrawals is 12 hours while Wire Transfer users have to wait for 24 hours before they can receive their winnings. Bet2U knows that online safety is paramount to the success of their operations, and they have taken the necessary precaution to ensure that bettors can place their bets in a secure environment. The site uses 128-bit SSL encryption technique to safeguard your financial and personal information during transit, and you can confirm this by looking out for the padlock icon at the bottom right corner of the website. Also, you can visit the Help page located at the top of the page to find information on registration, banking, and betting/bets. In addition, you can check out answers to common inquiries by visiting the FAQ section in the About Us page. New players may dismiss the site by looking at the simple layout and basic design, but the beauty of Bet2U lies in their minimalistic approach and friendly user interface. In spite of their extensive coverage of sports and odds markets, Bet2U is easy to navigate and you can easily find the event of your choice on the dashboard. When it comes to available markets and odds prices, the bookie has plenty of pre-match and in-play markets to offer to bettors, and their odds on big events are pretty decent. Their bonus packages are also very generous, and bettors can take advantage of their exciting promotions to boost their stake. The only thing that is lacking on the sportsbook is live streaming, and one can only hope that with time they shall integrate the service with the platform.